RVB: 00:01 Hello everyone. My name is Rik - Rik van Bruggen - from Neo Technology, and here I am recording a podcast with someone from a very different part of the world - all the way from India, in Mumbai - Luanne Misquitta. Hi Luanne. LM: 00:17 Hi Rik, how are you? RVB: 00:18 I'm very well. Thanks for joining us. It's great to have someone from the Eastern part of the world joining us in the podcast [chuckles]. LM: 00:27 I'm glad to be here. RVB: 00:29 Yeah, super. Luanne, I think we've known each other for a couple of years. I first got to know you when you were writing about Flavor Networks, which I did a couple of blog posts about, as well. Actually, they were one of my most popular blog posts. How did you get into graphs, Luanne? Could you explain it to us? LM: 00:52 I've been working with graphs for about six years. I think that's close to the time there was this Neo4j challenge running to write an application on Heroku using Neo4j, and Flavorwocky was the application that I submitted, that eventually I won the challenge. Some time before that, I got into graphs because I was working for a company that had trouble managing the profile of a person. This was a people management company so dealt with all kinds of aspects - hiring, talent management, compensation, learning, all kinds of things. And central to this entire system was the concept of the profile of a person. 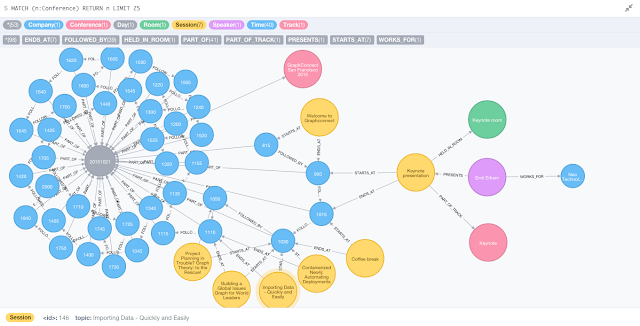 Up until the time that I found Neo4j, it was modelled in a relational database, and at some point it was the table that stored data for the person profile. It was huge. It had over 200 columns, and most of them were null, and it was normalized and denormalized very frequently, and it just didn't make sense any more. So, I was looking for something to solve this problem and that's when I came across this thing called a graph database, and of course, that was Neo4j. At that time, there wasn't any Cypher, there wasn't the Neo4j server either, it was just good old embedded. RVB: 02:27 Good old embedded, yeah [chuckles]. LM: 02:30 And immediately I knew that was the thing to model this, because it was schema-free, there were direct connections between a person and everything he's done. So one of the problems we have is that when you're collecting information about a person's profile, there are no two profiles that are the same in terms of the kinds of attributes they capture on a person. Of course, there are the usual standard ones - your name and where you live - but there are things like gaps in employment history, there are gaps in their learning. There are different types of learning. You do your talent manage-- your talent section looks quite different depending on where you are, and what you are doing, in which company you are in. So these kinds of things are very hard to fit into rows and columns, and that's where I thought Neo4j fit in. Once I started with it, I have never looked back. It's really been the solution for most things. RVB: 03:42 --whole range of problems go away. LM: 03:48 It wasn't just modelling the person. I'm sorry. RVB: 03:52 No, go for it. RVB: 05:19 You would never find it. LM: 05:20 Impossible. Almost impossible. RVB: 05:22 Totally right, very cool. So I'm hearing the modelling advantages but what did the flaring-- the flavor example have to do with that? That was an interesting one as well? How did you get into that one? Are you a chef? LM: 05:39 Well, I love food. No, I'm nowhere near a chef but I love food, I love cooking. And I was thinking of what am I going to submit to this contest? Most of the enterprise-y things were done and I was quite bored with enterprises at that time. Then I thought about food, I like food. Something that I had been reading about recently, actually a book review called the Flavor Bible, which lists ingredients and what they pair with. The rest of which from the classical triangle. So, two ingredients paired with a third and you can then combine them and produce something that tastes really good. So I thought that is a good graph problem, and it was really simple, but it was a domain that I liked and I thought it was fun to work with. That's how Flavorwocky came about. LM: 06:49 That is right, I work for GraphAware now. Yeah. RVB: 06:53 How is that going for you [chuckles]? RVB: 07:18 Very cool. I am a big fan. Last night I met up with Michal in London and we were doing some Czech beer tasting [chuckles]. It was an eventful evening. Very cool. LM: 07:33 What do you know? RVB: 07:35 No, don't get started on that one [chuckles]. That's going to be a very long podcast then. No. Let's talk about the future, Luanne. What does the future hold? You've been involved in some really exciting projects like, for example, Spring Data Neo4j. Where do you see this going? Can you share some of your perspectives? LM: 08:00 Well, I'll share with you what I've been noticing over the past couple of years and-- and as you know, I do the trainings for Neo4j in India as well, so I've been looking at various kinds of audiences coming in through for at least two years now. And there has been a definite shift in attitude towards graph databases from the early days where it was a real struggle to get people to understand why it's important. Although they got it, it was still something that they would really have to fight very hard to use in their organization. That has changed significantly over the last, well, even the last six months really, where you have people who already know about graph databases, they can immediately see where it's going to fit into solving their problems. I think with the kind of-- the reputation that Neo4j has , it's now becoming easier to get Neo4j are used in these kinds of companies, and I'm not talking about startups which pick up Neo4j very quickly, the other larger, mid sized company or enterprises. I think what I would like to see at some point and fairly soon is when graph databases become something that you just use. If you're planning a new project, it's very common to say, "Hey, we need a database," and no one will challenge you. You'll go and you'll pick up a database and you'll use it, typically an RDBMS. If you were to say, "Hey, we need a graph database," then it should be exactly that. Pick it up and use it. You shouldn't have to be debating for months over whether it's better than sequel or not and whether it fits or not. I'm really looking at that day as a defining moment for graph databases where they are just used, and people know when to use them and why to use them, and there aren't any questions about should I or should I not, unless it's a really stupid use case. That's what I think would be the ultimate future for Neo4j and graph databases. RVB: 10:20 I'm looking forward to that day as well. And I think lots of us work towards that goal and it would be a great thing. What about the Spring Data stuff? Is that ready for prime time right now? Are you guys planning new stuff there? LM: 10:37 Yes, it is. The Spring Data for that been released in September is, of course, ready. We are always planning new things. We have support for-- as you know, Spring Data 4 supports currently the remote Neo4j server mode only, and it was written from ground-up to actually support that, so it's really fast. We've broken it up into-- it's not only Spring Data Neo4j 4. It actually depends on a new library called the Neo4j Object Graph Mapper. So, if you want really fast OGM, then-- and not Spring, you can use the OGM directly. If you're a Spring person, then, of course, Spring Data Neo4j really uses the OGM under the covers, so there are a lot of features planned for both of those two. Very shortly, one of them is support for embedded Neo4j, and a whole lot of the new protocol, which is [crosstalk] coming up in Neo4j. Support for those, and as well as-- there is so much to do, but we are continuing to work on that and you should see some releases out pretty soon I hope. RVB: 11:51 Super. And I'm hoping that I'll see you at GraphConnect in San Francisco? LM: 11:55 I think you will, yeah. RVB: 11:57 Yeah, well, looking forward. That's super, great. All right, thank you for coming on the podcast, Luanne. It's been a great chat and I really appreciate it. LM: 12:06 Thank you Rik - it was great talking to you again. RVB: 12:08 Same here, and I look forward to seeing you on the West Coast. But somewhere along the way, I also started talking about my lack of a social life (so sad!!!) and the fact that I have a bit of fun with graph karaoke. I know - it's stupid. But so about half an hour before my talk, someone says "Can you do that for "Roxanne"?" ... and I am like - being a big Police fan and all - alright, Challenge Accepted. 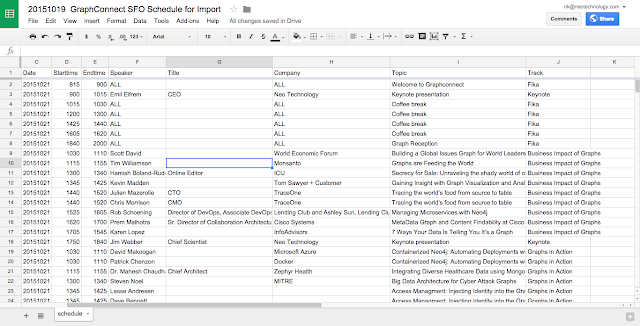 I put it into this google sheet. I made the google sheet available to the public (important). I downloaded that sheet as a CSV file, and grabbed the URL from my downloads folder. So there you go. I hope you enjoyed it as much as I did. 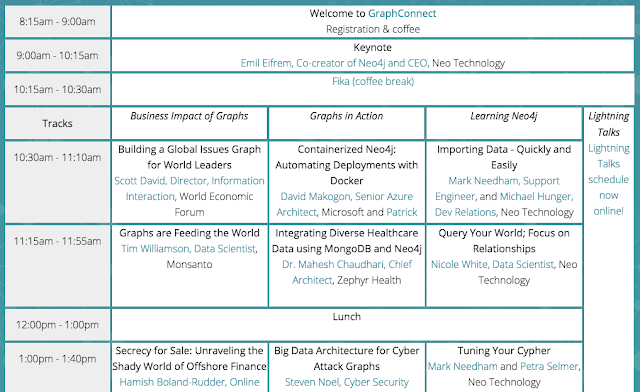 And don't forget to register for GraphConnect next week!!! RVB: 00:02 Hello, everyone. My name is Rik, Rik Van Bruggen from Neo Technology and here I am again recording a lovely new episode for our Neo4j podcast series. Today, it's interesting, I'm joined here by someone from the UK, Chris Skardon from Tournr. Hey, Chris. CS: 00:21 Hey, Rik. How are you? RVB: 00:22 I'm very very well and yourself? CS: 00:24 I'm good, thank you. RVB: 00:24 Super. Super. Hey Chris we've been interacting and known each other for a couple years already and you've been in the Neo4j ecosystem for a while. But I was triggered to get you on this podcast because of the dot net client announcement. Right? CS: 00:41 Yes. Yeah. Exactly. RVB: 00:42 Absolutely. So tell us who you are, Chris, and what have you been doing with Neo for the past couple of years. CS: 00:49 Right. Well, I'm Chris. I'm a freelance developer. I spend pretty much all my time in the dot net framework. A couple of years ago a client came to me and asked me to have a look at how to do, how to draw up one of their systems for them. I spent some time going through various no sequence databases to try and hunt out the best ones for their environment. And came across Neo4j probably about version one-six, I think. I've kind of stuck with it since then. CS: 01:34 It's addictive. Isn't it [laughter]? CS: Yeah. No. It's very addictive. I use lots of different databases at the same time and I'm not restricted to just one or the other but I find myself gradually moving more and more towards just putting everything into Neo because it works and does everything I need it to do. RVB: 01:55 Super. That's great to hear. What was the main attraction when you started going with it? What was the domain like or what was the main reason for going to Neo? CS: 02:07 Well, the domain is a large... The thing with databases is you can pretty much fit any domain into any database. CS: 02:17 It doesn't really matter. You can always fudge something into it if you want to. What I found with Neo was that it just fit around me just, it fitted around me having to translate anything. I didn't have to write a set of translation tables in my SQL server or start putting in weird links in my document database to try and hook things around and find things. It was just automatically linked and it makes navigating through the domain a lot easier. I mean the domain in this aspect was like a-- it's very hard to describe really. It's basically a graph [laughter]. The graph database just fit in it exactly as it's in here. Then they described it to me and it was a graph. They drew it out on paper, it looked like a graph. Everything they've ever drawn has been a graph based. It just was what it should always been. Neo was fast and forward and it's worked well for me since then. RVB: 03:19 Super. So my second question on these podcast is always, "Why did you get into graph databases?" So it's mostly around the modeling then for you. Right? The modeling fit that drove you there. CS: 03:34 Yeah. Yeah. I think the modeling fit and being able to query things. Obviously, started off from one six cypher was fairly basic and you were still doing queries using gremlin. RVB: 03:51 Those were the days. CS: 03:53 Yeah [laughter]. Back in the days. Gradually, over time it's moved much more towards cypher and cypher's just the much nicer language to use. It's a lot clearer to read and still get in the wrong, easily get it wrong sometimes. In general, you can takes something that's generated from the cypher and just read it and it makes sense. You know what you're pulling out because you can see it. CS: 04:23 I think as cypher gets more and more things added to it, I think it will just get better and better. RVB: 04:29 Yeah. That's good. Absolutely. So what about the dot net client. How and why did you get into that? That's probably a interesting as well. CS: 04:38 Well, so being a dot net developer, first thing, which pretty much every dot developer will do is, they'll fire up visual studio. Create yourself a little console test app to hook against the database and head into the NuGet world and do a quick search for Neo4j. So NuGet's like our package manager. So the equivalent for Ruby I think is things like Gems. I'm not sure what PHP has or python or any of those but it's just a package manager. You do a search for Neo4j and the top one pops up is Neo4jClient. There's a couple of other small ones which are developed independently or by other people but generally, I'm going to go with the biggest one because it's the one that seems to have the most documentation and users on it, and most likely to give me help when it goes wrong. CS: 05:37 I started using it. After a little while, there's a few things you want to have in it or there's a few bugs, and issued a few pole requests. Started answering questions on stack overflow. To, firstly, to help myself learn how to do the different things that people are trying to do. So I help the community, because the more people who can use it easily the more people there are to evangelize, in a sense, and get it out there. Gradually, over time, I just took over. I started doing a few more pole requests and answering more and more stack overflow. Then we hit our hiatus for a year or so where the original author Tatham had to step back because of many things, life generally. RVB: 06:27 Life gets in the way. CS: 06:28 It does get in the way. CS: 06:30 We spent a lot of time re-routing the pull requests, really small pull requests were maybe getting pushed through fine. The big one which we missed for a while was transaction support. CS: 06:43 The pull request that existed for that was massive. I mean it was good but it was such a big change that Tatham would have never and the time to do it. It kind of languished there for a while. CS: 07:01 Then about four or five months ago, either Tatham popped up on the list of clients give up page and said "I don't have time. I'm looking to hand this over to find someone." I had been doing a lot of help in stack overflow and stuff. I said "I'll take over." So long story short, I have. RVB: 07:25 Super. Yeah, I can't tell you how happy I and we are about that because it's, obviously, it's a big development community and it's really important for us to have someone maintain and help with that. So thank you so much for doing that I really appreciate it. So maybe just a final question here, Where is this going, Chris? Where is this going from your perspective? How do you see graphs evolve in the .Net world in general and how do you see the .Net client, the Neo4jClient evolve in the next months and years? RVB: 08:04 Any comments on that? CS: 08:05 Yeah. Okay. The client itself. We'll start with that. I think that's going to keep tabs with updates to the actual server itself. So two-three comes out soon and hopefully were able to cater everything that's in there. Then when version three comes out we're looking at, well I'm looking at adding the ability to use the bolt serialization underneath it it instead of just using rest. CS: 08:36 I'd like to get it to be as good as some of the other NoSQL databases are, in terms of .Net usage. That's just end up adding a few niceties around and investigating whether something like a link driver is feasible or even worthwhile doing and seeing, basically, see how it goes and keep on pushing it and adding new bits into it and make it faster and better. In terms of graphing in .Net world, hopefully, more people will start to use it. I'm lucky I work for myself so I can help pick the databases. CS: 10:17 -- it hasn't been that hard to do. I'm very pleased with it. I think it gives me a lot more forward momentum. I can do a lot more with my projects now when they're based around the graph than I could do with a document. I have a lot less problems with them. It's a lot easier to do. RVB: 10:39 Super. Cool. Well, I mean that's great input and great feedback and I'm sure lots of people are excited to see the .Net client but also Neo4j and the .Net world evolve that way. Thanks again for your help. Good luck with Tournr and your projects [laughter] for different clients and I think we I'll see you and buy your beer at GraphConnect. Right? CS: 11:06 Yeah. See you then. RVB: 11:08 I'm looking forward to that Chris.Very cool. Thank you for coming on the podcast. Really appreciate it and I'll talk to you soon. CS: 11:15 Yes. Same to you to Rik. I have always been a fan of The National, and when Matt Berninger embarked on a new band thingy, I of course had to check it out. Now this song has been in my head all week - so I mad a little "graph karaoke" for you guys - hope you enjoy! See you at GraphConnect for some more of this stuff?